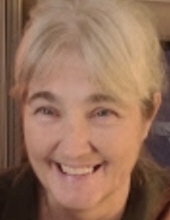 Barbara J. Veselenak of Royal Oak died suddenly April 11, 2019. She was 60 years old. Barbara was born December 12, 1958 in Highland Park to Mary (nee Weeks) and Joseph Dingwall. Barbara married Paul Veselenak on May 16, 1987 and together they were blessed with 3 children. She was an active member of St. David’s Episcopal Church in Southfield. She was the director of the Scrip program, kitchen coordinator and a member of the bell choir. Barbara enjoyed quilting, camping, traveling and spending time with her family and friends. She also loved her cats, Weeks and Sparky. Barbara is survived by her beloved husband of 31 years, Paul Veselenak and children, David (Holly) Veselenak, Sarah (Zack) Lexow and Scott Veselenak. She is also survived by her grandson, Sam, siblings, Carol (Joe) Herzberg, Helen (Steve) Zylstra, and Mark (Lori) Dingwall and many nieces, nephews, and friends. Friends may visit at Lynch & Sons Funeral Home, 1368 N. Crooks Road (between 14-15 Mile Rds.) Tuesday, April 16th, 12-8pm. A Funeral Service will be held at St. David’s Episcopal Church, 16200 West 12 Mile Road, Southfield, Wednesday, April 17th at 11am. Friends may visit at church beginning at 10am. Burial will follow in White Chapel Cemetery in Troy. Memorials may be made to the Juvenile Diabetes Foundation, 24359 Northwestern Hwy #225, Southfield, MI 48075 or St. David’s Episcopal Church, 16200 West 12 Mile Road, Southfield, Michigan 48076. "Email Address" would like to share the life celebration of Barbara J. Veselenak. Click on the "link" to go to share a favorite memory or leave a condolence message for the family.